1992-2008 | Farrell Meisel International Media Consultancy, Inc. In the film and television business, life doesn’t end at retirement or when “looking for new opportunities.” In fact, in many cases, it starts at those stages — most often, in consulting. And that’s when the real work begins. But what exactly does a consultant do? And why are they so in demand? VideoAge sought out the folks who’ve done it and lived to tell the tale. As far as money is concerned, a consultant tends to make a good living, with income around $200,000-plus per year. Jobs are few and far between, allowing for “good-quality” family time for those who still have kids at home or a tolerable spouse. For steady income, some American consultants, especially those in the Los Angeles area, also toil as expert witnesses in court cases involving disputes over contracts, libraries and the dollar value of content. And some even generate revenue by sitting on various media company boards. As he prepared to leave The Movie Channel and the U.K., Meisel began fishing among those who’d expressed interest in his services. The first to bite was Turkey-based Ihlas Media. “I helped reposition them,” said Meisel, who’s currently working with the firm on another initiative. “They’re very enterprising people in a very conflicted part of the world,” he said. For the most part, Anthony Friscia, an Oak Park, California-based consultant, concurred. However, he said, “I’d prefer a regular job. There’s more stability there. Plus, with consulting, you don’t get bonuses such as medical insurance or a 401(k) [retirement fund].” Friscia, who began his career as a financial analyst at Viacom in 1975, and has served as a consultant for Twentieth Century Fox, among other companies, has recently become involved with Computer Applications Development (CAD), a Burbank software firm that created a computer system that studios can use to check the availability of a film or TV show’s rights in a given territory. Friscia, who cites his areas of expertise as finance and contracts, finds his line of work especially fulfilling when he gets in on the ground floor. “I see big things ahead for CAD,” he said. Whether you’re reading contracts, picking apart a company’s silly hierarchical structure or selling films in all corners of the globe, when you’re a consultant, you might think you work for yourself, but you’re on call 24 hours a day, seven days a week. Digital technology and the Internet are rendering the current television business model ineffective. It was that fact which provided the impetus for a group of four TV biz experts to meet during the most recent MIPCOM. The group informally exchanged views on the new paths the industry could and might take. The Cannes agenda was shaped by several news developments such as: Rupert Murdoch’s interest in merging his satellite TV service Sky Italia with Telecom Italia, Italy’s telephone company; the interest of Silvio Berlusconi’s Mediaset in the same telephone company, and the Italian government’s interest in keeping Telecom Italia’s fixed lines out of Berlusconi’s (or his proxies’) hands. Similarly, in the U.S., Murdoch is said to be ready to divest of his satellite service, DirecTV, in order to focus on other forms of transport and consolidate his grip on content. Indeed, worldwide focus is now on content and transport: cable, telephone, radio spectrum and, in the future, power lines. As far as spectrum is concerned, the U.S. government just received bids of $14 billion for cellular radio frequencies auctioned to companies that want to build a wireless broadband network. In view of the fact that only 20 percent of U.S. households use aerials to receive television, it is envisioned that U.S. TV station groups could better monetize their allocated frequencies by renting them out to wireless transport services. Talk in Cannes turned to the various challenges that convergence of digital technology and the Internet pose to the TV industry on the technical, regulatory and business model levels. The moderator of the get-together was VideoAge’s Dom Serafini, who was assisted by Italian editorial contributor Enzo Chiarullo. The four panelists, who have expertise in all areas of the business of television, were: Sal Campo, consultant for, among others, Digital Age Solutions; Russ Kagan of International Program Consultants; Farrell E. Meisel, president of FMI Media Group, and James P. Marrinan of Entertainment Media Consultants. Collectively, the panelists are familiar with studio production and distribution, satellite and cable TV, broadcast TV, mobile TV and most other new technologies. 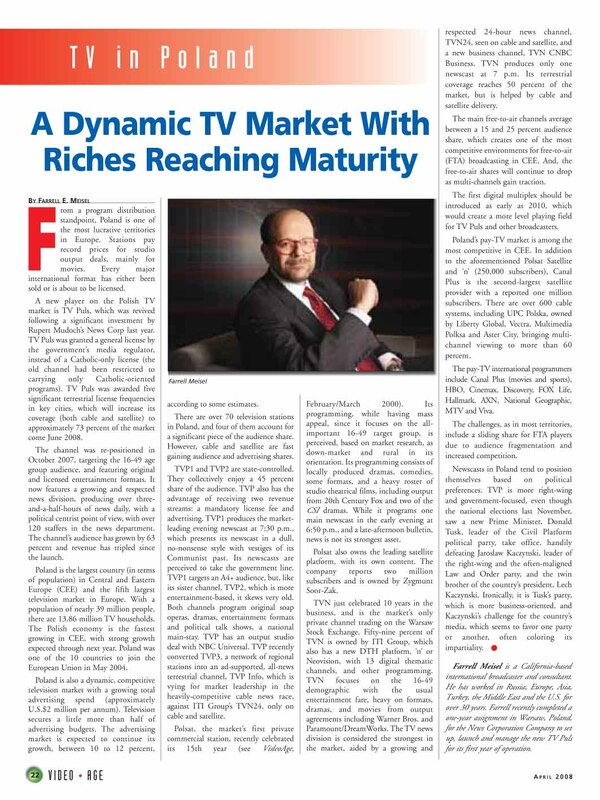 Serafini’s preamble stated that, in order to face new challenges, the business of television has to be redefined. Companies have to abandon their “vertical integration” and “jack of all trade” philosophies and opt for one core business–be it transport, content, advertising or service–since no one company could, or should, be in more than one of the above-mentioned fields. Furthermore, Serafini predicted a return to governments’ active roles in regulating all four of those fields. Finally, it is said that the combination of digital technology and the Internet has developed a streaming technology that will replace and unify all current digital TV standards. A set-top box that adapts the stream coming from any form of transport (cable, DSL, broadcast, cellular, etc.) to a regular TV set is also being envisioned. Indeed, according to Marrinan, the licensing divisions of the U.S. studios are now working on a single-point distribution concept, with digital rights management technology that is able to recognize the interface. This means that a file containing content is not only able to recognize the player–be it a TV, PC, iPod or cell; but also to identify the mode of transport, so that the concept of windows will be preserved. In other words, if the content stream goes through cable, it’s the cable window; if by airwaves, it’s the broadcast window, and so on. “In two years time the studios will forward-motion this delivery development,” he added. To Campo, “the key is multiplatform and content delivery network technology (CDN), because the key is to monitor, measure and monetize,” where “monitor” indicates the window that the audiovisual stream is utilizing, “measure” is the ability to account for every user and “monetize” offers a way to maximize revenues. The CDN technology can deliver media content in any form over multiple distribution platforms (i.e. cellular, VoD, IPTV, etc.). CDN files are compressed, thus requiring less storage, yet they are “robust,” meaning reliable, and backed up by “redundancy” or a repeated form of delivery to assure quality. Farrell Meisel, an international media vet whose career has spanned the globe from England and Germany to Turkey, Russia and Southeast Asia, has reactivated his own global consultancy FMI Media, after his latest stint with Alhurra TV in the Mideast.From a new base in southern California, Meisel will, effective immediately, do strategic planning in general media management, creating hands-on solutions in programming, news, branding and marketing. No clients have as yet been officially specified. For the past three years, Meisel provided infrastructure design, program development and news format expertise for Alhurra, a U.S. government-backed pan-regional, satellite-delivered newsie, which began beaming in early 2004 to Arabic-speaking countries in 22 countries, including Iraq. Meisel also guided the training of Alhurra management and staff in commercial TV management and production techniques. (MediaCorp) from February 2001 through August 2003. MediaCorp is one of Southeast Asia’s largest broadcasters, with a 75% audience share. Prior to joining MediaCorp, Meisel, as principal in FMI Media from 1997 to 2001, repped clients in various markets, including TGRT in Turkey, SBS Broadcasting in western Europe, and the CTC network in Russia. He was also a senior VP for HBO Intl. based in London in the early 90s. Before becoming an overseas TV exec, Meisel served in senior management posts in the U.S., including WWOR in New York during the 1980s. Nothing more clearly illustrates for Farrell Meisel how the Hollywood mystique cuts across borders than a limo ride he once took in Turkey with actor Roger Moore. For Meisel, senior managing general consultant at Alhurra, an Arabic-lingo satellite service funded by the U.S. Congress, working abroad was a way to honor the memory of his father, a refugee from Nazi Germany, and to spread what he learned about the TV business as a program director at WWOR in New York. “I was given a gift, and I wanted to give something back.” he says. This model successfully spread to other U.S. cable channels and then to overseas commercial stations. Meisel says it works because consumers around the world are really very similar. Meisel took his first overseas assignment at Turner Intl. Moscow in 1992, helping to launch TV6, the first commercial channel to go on the air after the collapse of the Soviet Union. His international resume includes stints at the Movie Channel Middle East, Time Warner Intl. HBO in London, TGRT in Turkey and the Media Corp. of Singapore. The U.S. government’s Broadcasting Board of Governors has tapped Farrell Meisel as consultant for the Middle East Television Network (MTN), a new 24-hour Arabic language satellite news and information channel, to be launched later this year.Meisel has been Chief Operating Officer for Singapore broadcaster MediaCorp Group since Feb. 2001 and worked closely with CEO Ernest Wong in the months leading up to the liberalization of the territory’s media sector. “We wish Farrell and his wife Vered, the very best as they return to the U.S., after nearly 12 years abroad,” said Wong. Singapore’s newly competitive free-TV screens are providing the country’s most-watched on- and off-screen industry action. Although some of the pre-launch uncertainty has cleared, the full impact of the May 2001 launch of two new terrestrial channels — SPH MediaWorks’ Mandarin-language Channel U and the English-language TV Works — on a market that operated as a Media Corporation of Singapore (MediaCorp) monopoly for about three decades is yet to be assessed. What is clear is that neither of MediaWorks’ channels did as well as promised at first, prompting immediate schedule shuffles and programme production and budget adjustments. Rival MediaCorp also adjusted tactics in line with the emerging reality of a competitor that does not appear to be — at least intially — as powerful as it promised to be. Confident of an effective strategy, which he says minimised damage to MediaCorp’s market share, chief operating officer Farrell Meisel says the station will not continue to spend as much on acquisitions as it did in SPH MediaWorks’ pre-launch phase. Meisel adds that the process of adjusting to a new environment will be ongoing. “No responsible broadcaster can … just buy everything — and we’re not going to buy everything,” he says. When the government, in June 2000, announced its decision to open up the terrestrial market. MediaCorp snapped up rights to most top US series. On MediaCorp’s Channel 5 schedule for the three months following SPH MediaWorks’ launch were, among others, new series of The XFiles, The Sopranos, NYPD Blue, Ally McBeal, Friends, Felicity, Ed and The Gilmore Girls. MediaCorp also bought Who Wants to be a Millionaire, which launched in May, and The Weakest Link, which has not yet been scheduled. In yet another adjustment, MediaCorp repositioned its 24-hour free-TV sports channel, SportsCity, as a mixed entertainment channel targetting the young and the trendy. The Mandarin-language City TV, offering 35 hours of entertainment and 50 hours of sports a week, launched on May 14. As a first step in its own reorganisation, SPH MediaWorks cut TV Works’ local production output in half — from 10 hours a week to five, including sitcoms — as the station focused resources more tightly across smaller time-bands, says SPH MediaWorks’ CEO Lee Cheok Yew. The production team was also reorganised in a bid to boost performance and to increase commercial value. Further changes are expected in August, when the new production season begins. MediaCorp’s blanket buys left TV Works in the cold on hit US syndicated programming for two years at least. TV Works has, instead, gone for British shows such as the comedy Goodness Gracious Me. The channel has also changed its policy on reality shows, game shows and formats, acquiring the finished series of The Mole and format rights to The Vault. MediaCorp, meanwhile, is believed to have reigned in budgets for broader economic reasons. The move comes ahead of the bleak overall economic outlook for Singapore and, according to ACNielsen’s rate-card based figures, a 0.7 percent drop — US$59 million — in Singapore’s TV ad revenues in first quarter 2001. Industry sources believe the TV ad revenue drop may, in reality, be as much as 20 percent. The networks declined to disclose their advertising figures. What MediaCorp will say, however, is that audience share at Channel 5 has increased as a result of the competition. Chinese Channel 8 suffered a 10 percentage point drop in P15+ audiences, “so we are doing quite well,” Meisel says. Among Channel U’s strengths, meanwhile, is its strong relationship with Chinese content creators around the region, Lee says. This includes a relationship with premier Chinese-language producer, Hong Kong’s Television Broadcasts Ltd (TVB) for, among other titles, Comic King. The movie is TVB’s first film effort, and is said to involve the largest amount of money MediaWorks has spent so far on a film acquisition. Channel U also signed a deal with one-time giant, Shaw Brothers, which is returning to movie production after 20 years. In addition, Channel U has acquired a guaranteed 400 hours of drama programming a year from TVB, which currently supplies rival Channel 8. Channel 8 has in the past carried about 200 hours of TVB programming a year. The TVB deal with MediaWorks runs from 2002 to 2007, and also gives MediaWorks first refusal rights to the balance — about 160 hours — of TVB’s annual 560-hour drama output. 3,000 residents aged 4 and above). * Singapore has two ratings systems: MediaCorp uses TNS. So far, production from MediaWork’s StarEastWorks US$19-million joint venture with Hong Kong’s StarEast has not been factored into Channel U’s performance because the company is too new. The first shows are expected to be available in 0,4 2001. With the local market at less than one million TV households, ex-Singapore revenues are one of the key components of growth. In addition to driving market development at home, the Singapore Broadcasting Authority’s (SBA) strategy is to generate more regional and international co-productions and to promote exports beyond the Chinese-speaking markets of Hong Kong, Taiwan and China. Broadcasters, production houses and producers are, to a greater or lesser degree, following the SBA’s lead onto the regional/international stage. Meisel says MediaCorp has developed relationships with partners in China, Malaysia, Taiwan and Hong Kong. Lee says Channel U’s 300 hours of entertainment programming will be on show at MIPCom this year. China distribution plans are also being drawn up. So far, there is no clear strategy for regional/international syndication of its English-language programming. “It’s a totally different market. On the English-language side, we have to survive in the local market”. For now. COPYRIGHT 2001 Reed Business Information. This material is published under license from the publisher through the Gale Group, Farmington Hills, Michigan. All inquiries regarding rights should be directed to the Gale Group. For permission to reuse this article, contact Copyright Clearance Center. SINGAPORE — Singapore’s MediaCorp TV is betting that not one but three versions of “Who Wants to Be a Millionaire” will spike the guns of new competitor MediaWorks.MediaCorp’s Channel 5 launched what it hopes will become “Millionaire” frenzy by skedding the first of 10 episodes of the U.S. production at 8 p.m. on March 14. Following that will be the April 18 preem of the Singapore production, airing each Wednesday and Thursday at 8 p.m., a ploy intended to keep viewers away from MediaWorks’ two new channels, the English-lingo TV Works and Channel U (Mandarin), which debut May 21. Spanning the multicultural realm, a Mandarin-lingo “Millionaire” will start on MediaCorp’s Channel 8 in August, also telecast twice a week. Inhouse unit MediaCorp Studios is producing both versions. MediaCorp group CEO Ernest Wong and COO Farrell Meisel believe the Singapore-formatted “Millionaires” will prove the broadcaster’s edge over its rival in local production. They point to the group’s formidable annual output of 1,900 hours of locally-made programming as something MediaWorks can’t hope to match, bolstered by MediaCorp’s output deals with Warner Bros., 20th Century Fox, Paramount and Disney, as well as close relationships with DreamWorks and CBS Prods. Meisel, an American TV exec, joined MediaCorp Feb. 12 after helping to develop cable and terrestrial TV businesses in Germany, the U.K., Russia and Turkey. SINGAPORE — The terrestrial TV battle is heating up, with the old guard and upstart broadcasters both claiming they are winning auds.Incumbent MediaCorp reckons it is holding its own against recently launched MediaWorks, the broadcast arm of publishing giant Singapore Press Holdings (SPH). According to MediaCorp’s ratings from Taylor Nelson Sofres (TNS), its Chinese-lingo Channel 8 and the revamped City TV are doing well despite the threat from MediaWorks’ Channel U, which launched May 6. “Channel 8 has maintained a 50%-55% audience share since U’s launch,” says Farrell Meisel, MediaCorp’s group chief operating officer. He has every right to be confident. Channel U changed its sked to a format similar to Channel 8 after only one week on-air — an admission that its strategy isn’t working. “Imitation is the sincerest form of flattery. It’s quite unusual for a new broadcaster anywhere in the world to revamp so soon,” comments Meisel. Over at MediaWorks, which is using AC Nielsen to gather ratings, bosses claim the Channel U rejig is a consumer-friendly response to audience need. The battle for English language viewers between MediaCorp’s Channel 5 and MediaWorks’ TVWorks has seen an even bigger victory for the incumbent, according to TNS figures. TVWorks bowed May 20 with “Godzilla,” but the movie’s 4.7% aud share was its highest of the night. The $1 million musical “TV Land” averaged a dismal 1.6%, while MediaCorp’s Channel 5 never fell below 10% and peaked at over 18%. Pulling out all the stops with David Copperfield’s “Tornado of Fire” and celebrity charity versions of “Who Wants to Be a Millionaire,” Meisel sees the ratings as vindication of MediaCorp’s hard work. The mood in Singapore Press Holdings’ many print titles has been celebratory, but if TNS’ figures are anything to go by, the newcomer has little to smile about. TBS-Russian TV set to bow Fri.
Turner Broadcasting System confirmed yesterday that it will launch Russia’s first independent TV channel on Friday, as expected (Daily Variety, Nov. 23).TBS is partnered with the Moscow Independent Broadcasting Co. in the venture. Farrell Meisel, formerly VP of programming for indie WWOR-TV in New York, will serve as director of operations for TV6 Moscow. The news was well received on Wall Street, with the stock initially gaining 1 .1% in value on the announcement, but settling down later with Turner shares closing down 75 cents at the end of the day to 22.